Semantic search is the next big change that will drastically overhaul the world of digital marketing. 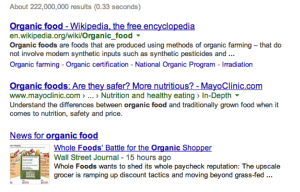 What is semantic search? With semantics being the ‘the study of meaning’ or in layman’s terms, the meaning or interpretation of a word, ‘semantic search’ is embracing this concept through interpreting the context of what you’re searching for in content across the web and connecting it to related topics. …a semantic search engine will expand the options look at sub-content based on organic food—organic vegetables, grass-fed beef, organic recipes, etc. and detect and realize the context of your search based on everything from your search history to the search history of users like you, to your location. Search’s goal, with these factors in mind, is to figure out that when you’re walking down the street in Washington, DC you’re are interested more specifically in say, “organic vegetable markets”, and when you’re touring the campus of Oberlin College, you want results about the best college cafeterias for organic foods. In this way search intends to give you the results that you want, perhaps before you know what you’re looking for. As you can see, semantic search differs greatly from the conventional search engine model we’ve grown accustomed to. Whereas the older model would focus on pure mentions of a keyword on a page and pages linking to it, the semantic search model displays results on context alone. This is partially to make the search engine better at finding results but to also punish all the sly marketing companies and personnel that used the system against itself by ‘keyword stuffing’. Effectively, semantic search will make connections between content and display results accordingly. But now you’re asking, ‘alright we get it, but what does this all mean for us marketers!?’. Ultimately, semantic search is forcing marketers to focus more oninbound marketing, which is essentially marketing through content in blogs, podcasts, video, newsletters, whitepapers, social media, etc. that drives a user to your brand or website (compared to outbound marketing like cold calling, radio spots, direct mail etc.). 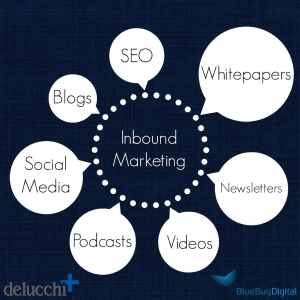 Essentially, inbound marketing uses every available digital marketing platform to distribute interesting and engaging content that does not explicitly set out to sell whatever the product in question is. This content is developed solely with specific conversion funnels (meaning the order of pages a user looks at before they become a customer) and semantic topics that seek to catch potential buyers at critical junctions in the product/brand awareness journey. Granted, a lot of marketers and brands have adopted most of these tools to share their content already, but it’s more important than ever with semantic search now gearing up and the lines between search, social and quality content begin to blur.